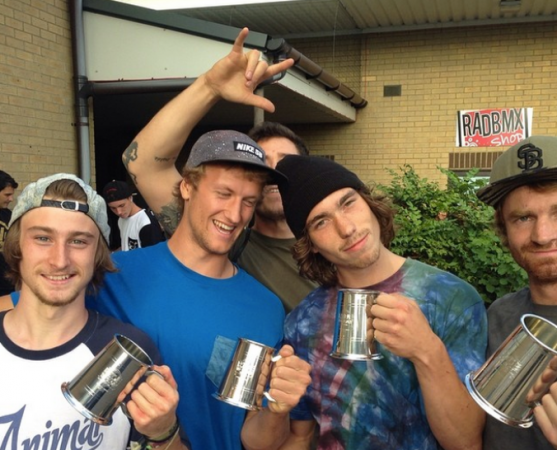 Champions #RTG2014 — WETHEPEOPLE BIKE CO. Thanks to everyone that voted for us and supported us on the epic Ride UK BMX #RTG2014. Mike Curley, Jason Phelan, Dillon Lloyd, Mo Nussbaumer, and Jordan Waters all totally deserved all of this for getting wild drunk and racking the points in all the challenges. Special thanks to Joe Bailey on the shooter and Calum Earnshaw for a sick edit. Cheers to Red Bull Flow as well for the £2,000 prize money that will given directly to the riders and go towards a big gammon joint and some pallets of whiskey at Chrimbo. Big thanks to RIDE UK as well and all the other brands who had a whole bunch of fun on the way.